Applications will be accepted beginning February 21st, 2019. Applications are due March 15th, by 5 PM. All group members are required to submit a $200 Deposit prior to filling out an application. Plan to participate at the Room Sign-Up Lotto in AD28 on April 10th, 2019. At 9 PM (2017 HS Graduates and before) and 10 PM (2018 HS Graduates). A lottery system will be used as each student will draw a number to determine the order of selection. 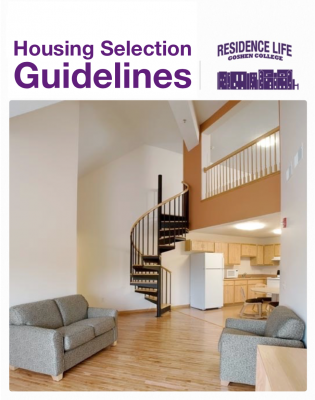 First and Second-year residential students are required to live in Kratz, Miller, or Yoder Hall. Third and Fourth Year Students are eligible for Kulp Hall single rooms. $50 Room Deposits are required before sign up night on April 10th. Fall 2019 SST students or anyone not on campus fall semester will NOT need to attend room sign-up on April 10th. You will instead make your housing reservations for spring online in September. CLICK HERE for more information about Kulp, Kratz, Miller, and Yoder Hall. **Available for commuters and fourth-year students eligible for senior discount.